Chachi ” The Rocketman” Valencia is the world’s best Human Cannonball. Now Booking for extreme events Worldwide. 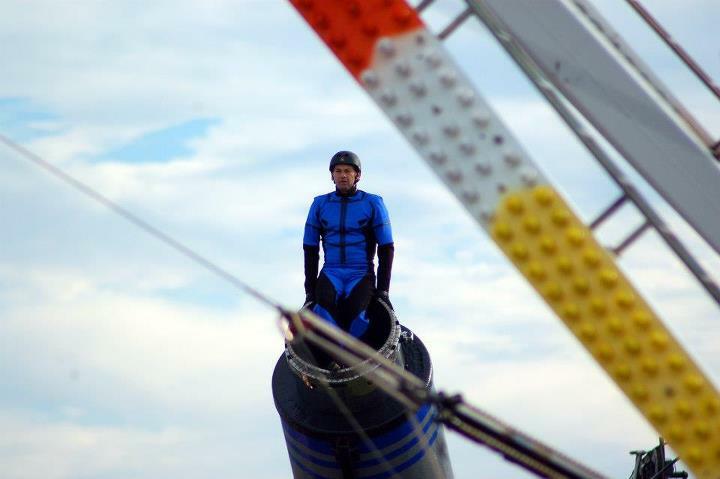 Chachi “The Rocketman” Valenica makes his living as a Human Cannonball being shot from a cannon; free flying through the air at speeds of (55mph), heights of over (65 ft), and distances of (165ft). He lands in a narrow net, set (20ft) off of the ground and rocks the crowds every time when he hits his target at the center and takes off his helmet in a heartfelt victory salute. The Rocketman defeats gravity once again. The Rocketman Valencia has twenty three years of Human Cannonball experience. The Rocketman has performed as a Human Cannonball in the world’s biggest events. Not only was he the 2012 London Olympics’ jaw dropping finishing bang to their closing ceremonies, televised to (billions) of people around the globe, he was also the secret weapon in Rio De Janeiro’s 2014 Carnival competition (witnessed by an audience of millions) and becoming the first person ever to shoot 6 times in 40 minutes atop a giant moving float. Chachi Valencia soars over the big rides at fairs and amusement parks in the USA, making newspaper headlines and bringing instant PR attention to every venue he’s in. He was famously featured last summer in a BBC special news report along with his wife, Robin Valencia, the only female human cannonball in Europe. The Rocketman Valenica Gears up for a BIG LAUNCH! Chachi has over twenty three years of Human Cannonball experience. Chachi Valencia, alias The Rocketman, is one of two men in the world who were trained by CANNONBALL DAVID SMITH and who have the physical and mental capabilities to withstand the G force of a free flight at a maximum speed, distance and altitude, once they have been launched from the MOST POWERFULLY accurate human cannon on the planet. The Rocketman Valencia has twenty three years of cannon experience. He has worked with various cannon designs-developed, engineered, and built by Cannonball David Smith, the Guinness Book of World Record holder for THE LONGEST CANNON shot and indisputably the best cannonball who ever lived. Chachi has been given the honor, after apprenticing with Cannonball Smith, of taking over the world record cannon to forge his own flight path. The Rocketman Valencia is an amazing “must see” during a person’s lifetime. He opens huge concert events by flying over the stage and even does an inspiring 20 minute introduction speech on the mic while prepping his landing area- for the shows that require a longer performance time. The audience has so many questions about the cannon and the details of the stunt that he never runs out of dialogue. When the crowd has the chance to get to know Chachi and understand more about the feat he’s about to execute, they are all the more excited by the spectacle of the Human Cannonball and want him back each year.